Owning a home is that glittering American ideal, spoon-fed to the public from the time we’re barely old enough to open a bank account. But just how easy is it to accomplish this end, and become a hot-blooded American with a mortgage, a dog and a seldom-used lawnmower? 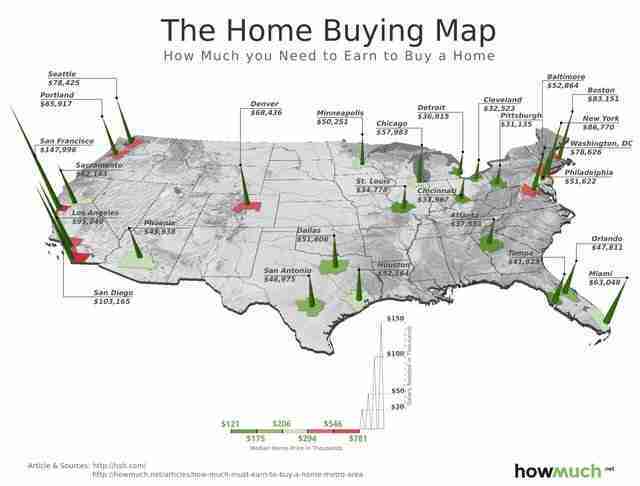 Well, this all depends on which metropolitan area you live in, and according to a map assembled by howmuch.net, the cost varies by a pretty extreme degree from location to location. 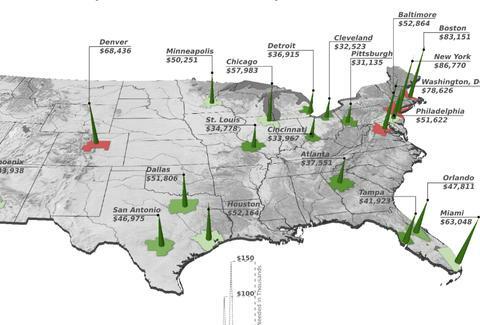 Using data compiled by the American Association of Realtors, the following map elucidates the median income it takes to own a home in the American West, East, Midwest and South, and which cities are the most/least amenable to homeownership. According to the data, the West coast is the most expensive geographical hub, with a median home price of $319,000. Compared with the Northeast ($262,500), the South ($196,400), and then the Midwest ($175,500), it’s a fairly upward economic trajectory as one travels toward the Pacific. When it comes to the most expensive cities for homeownership, San Francisco and its thriving tech scene means you need to earn at least $147,996 to own a home in the city, the median price of which is $781,600. On the opposite end of the spectrum is Detroit: You’d only need $36, 915 a year to own a $148,667 home in the motor city. That said, have a look at the map above, and take solace in the fact that there’s no major housing bubble developing here at the moment.